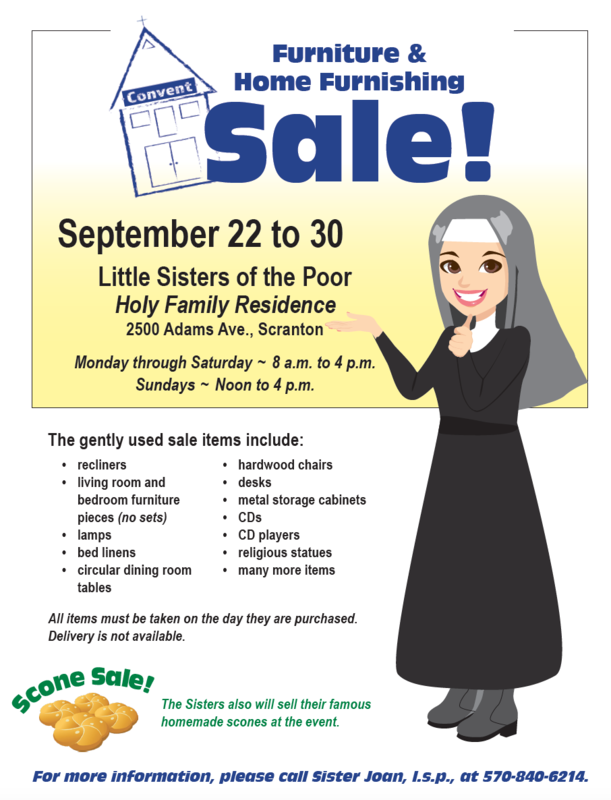 The Little Sisters of the Poor will host a furniture and home furnishing sale Saturday, Sept. 22 through Sunday, Sept. 30, in the auditorium of Holy Family Residence, 2500 Adams Ave., Scranton. The sale will take place from 8 a.m. to 4 p.m. Monday through Saturday, and 12 to 4 p.m. Sundays. The gently used sale items include recliners, living room and bedroom furniture pieces (no sets), lamps, bed linens, circular dining room tables, hardwood chairs, desks, metal storage cabinets, CDs, CD players, religious statues and a whole host of other items. The Sisters also will sell their famous homemade scones at the event. Please note, all items must be taken on the day they are purchased. Delivery is not available. For more information, please call Sister Joan, l.s.p., at 570-840-6214.